you get a traffic citation. We understand the ever-changing traffic laws in ‘The Big Apple.' Regardless of the violation class, the odds are that we've helped hundreds with your identical problem. Make sure to call us first before you agree to give up and settle that ticket without fighting. One Call. That's All. Keep Driving. Contrary to popular belief, there is no legally recognized ‘leeway.' We can help you stay within your legal rights and help you evade the ticket. If you're over .08%, you're guilty of DUI. Our DUI lawyers have the skill, persistence, and knowledge to help you get that DUI reduced and often thrown out. Getting caught driving on a suspended license can land you in jail depending on the circumstances. Our firm is versed in New York traffic law and license suspensions. 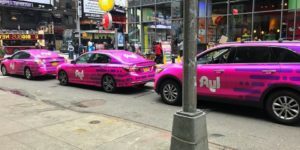 Originally billed as a solution to traffic congestion, new studies are finding out that services such as Uber and Lyft may be adding fuel to the fire. NY Traffic Firm represents drivers with a variety of legal challenges. Find out how a traffic ticket attorney helps drivers who are ticketed, cited or charged. Driving is a privilege, which the state of New York can revoke if you get too many points on your license or commit certain other traffic violations. If you are accused of violating traffic laws, the consequences of those accusations could be far-reaching. Whether you're at risk of jail time due to DUI charges, are facing the loss of a commercial license, or are simply worried about high insurance rates and points on your license, you are right to be concerned about the impact of a citation or a traffic arrest. Fortunately, there is help available. NY Traffic Firm is a full-service firm whose ticket defense attorneys provide aggressive legal advocacy to clients in New York and New Jersey who have been accused of violating the rules of the road. Fighting a ticket or appealing charges is vitally important when you are accused of wrongdoing, and our firm will offer guidance on the best strategic approach to protecting your license and driving record. To find out how a NYC traffic ticket lawyer can help you after an incident on the road that gets you into legal trouble, give our firm a call today to talk with Daniel Kron, Esq - an experienced legal counsel in our team. We know that every ticket and moving violation is serious and we understand how important it is for you to be able to protect your license to drive. Let us put our legal experience with NY traffic laws to work for you. How Does a NY Traffic Ticket Attorney Help You? A New York traffic attorney advises you on the potential consequences of a citation or an arrest related to your driving, and assists you in determining if you should fight the accusations or negotiate a plea. When you pay a ticket, you give up the chance to contest the charges because sending in your fine is an admission of guilt. This is a step you should not take until you have talked with a lawyer about whether there are better options. NY Traffic Firm consists of lawyers has helped many motorists to avoid conviction and to protect their driving record. This is vital if you have a job that requires a clean driving history or if your goal is to keep insurance costs down instead of having to pay high premiums for years to come. It is especially essential to fight any charges that are criminal in nature, rather than just simple traffic infractions. Our traffic lawyers have the legal skills and strong criminal defense background to help you no matter how serious your issues are. Daniel Kron, our great NYC ticket lawyer can advise you on how to plead, can represent you in safety hearings, can help you to fight for restoration of your driving privileges, and will advocate for you in appeals. Whatever your situation, we can offer you the guidance and advice that you need to be as effective as possible in protecting your license. Why is It Important to Get Legal Help with Traffic Offenses? Although many people assume that a traffic ticket is a minor inconvenience, this is not necessarily the case. When you are found guilty of a traffic offense, there is the risk that your insurance rates will rise significantly and stay high for years. High bills can hinder your ability to accomplish other financial goals. If you try to apply for a job that mandates a clean driving history, the ticket on your record could stop you from taking advantage of that opportunity. Finally, too many tickets in a short period of time can result in the suspension or revocation of your license, as can conviction for certain offenses like drunk driving. You have the legal right to defend your good name and to make the state prove that you violated the law. The Constitution guarantees due process and guarantees that you'll be treated as innocent of offenses until your guilt is proved. Don't just give up without a fight if there is a way to raise doubts about whether you did what you were accused of. Stand up for your good name and work with a NYC traffic attorney who has the knowledge and experience to help you try to keep your record clean and avoid consequences. Taking traffic citations seriously is important to your future, and it's a bad idea to just pay a ticket or to try to contest the ticket with no plan other than showing up in court and hoping the officer who cited you does not come to testify. Reach out to an experienced lawyer who has successfully helped countless New Yorkers to fight their tickets, and find out how we can help in your situation. NY Traffic Firm has a long track record of successfully representing individuals who have been cited for a moving violation or arrested for a traffic offense. Don't just accept accusations made against you that you violated traffic laws. Reach out to our firm today to find out about the ways in which traffic lawyer in NYC can represent you.